The Howard Johnson Gatlinburg Downtown is in a great location 1 block from the center of town with beautiful Smoky Mountain views. The property is within walking distance to all attractions. 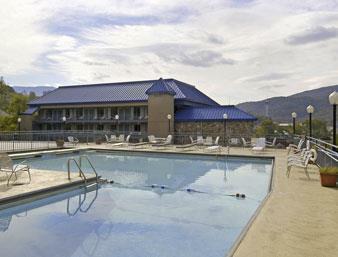 Property amenities include Complimentary Continental Breakfast and High Speed Wireless Internet. Free Parking. The Howard Johnson has 4 floors with elevators and 102 rooms. Some rooms with wood burning fireplaces, some feature a jacuzzi. Why not treat yourself to a specialty room with a jacuzzi or wood burning fireplace. Other room features include coffee makers, data port phones, iron and ironing boards, and a 25 or 34 inch TV with free HBO and 70 cable channels. Guest laundry is available at property. Sorry, no pets allowed.